The Mecca of Philippine Basketball, the Araneta Coliseum, has finally found its rival in Henry Sy's Mall of Asia (MOA) Arena. 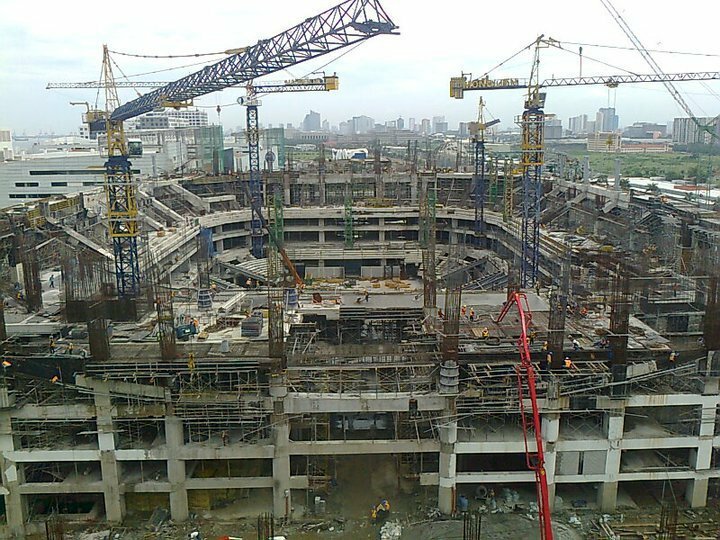 The MOA Arena is being built right in front of the Mall of Asia. Its construction is expected to be finished at April, 2012. The so called arena will resemble the Philips Arena in Atlanta Georgia which is the home court of the Atlanta Hawks. The UAAP and the NCAA has already signed a contract with Henry Sy. Thus, the opening of the UAAP Season 75 and the opening of the NCAA Season 88 will be held at the MOA Arena. NU, the school that belongs to Mr. Henry Sy will be the host of the next year's UAAP while Letran will host the NCAA Season next year. The opening of UAAP Season 75 will surely be a big event because Henry Sy is the owner of NU. Here are the main differences of the MOA Arena and the Araneta Coliseum which I got from the Kasali ang School ko sa NCAA or UAAP Facebook page. "The MOA Arena, a 16,000 seater (20,000 SRO), would rival the fabled 52 year old Araneta Coliseum, a 15,00 seater (20,000+ SRO). SM Tickets, which would be the ticketing system for MOA Arena and SM Concert Grounds, would rival Ticketnet, which is an exclusive ticketing system for Araneta Coliseum." the philips arena seats 18700+ for basketball, moa arena wont really resemble it, but still, henry sy will have more money in his money pool to dive into..
Ah yes! Definitely better for me! Much closer to home and more parking space!